YouTube have announced 360 degree live streaming video in a battle for video supremacy, taking Facebook head on. It has been a battle for live video lately, and for a couple of days after Facebook's F8 conference, it looked like YouTube was lagging. No pun intended. But yesterday, Google's YouTube unleashed a new feature that lets creators and brands live stream their 360-degree clips. 360° Live streaming on YouTube is catching up to Facebook? It's not a giant leap for YouTube. It's a quick catch up. YouTube had already launched support for 360-degree videos a year ago. Brands like Nike, GoPro, Gatorade, and Lionsgate have experimented with it. Lionsgateused the YouTube feature for a 360-degree video for its 2015 film "The Hunger Games: Mockingjay, Part 2". This move, was a retort, a comeback against Facebook, who bragged about a 360° camera support and a live content hub at their annual event last week. What we can expect from YouTube's 360° Live streaming? YouTube announced "...these days, virtual reality and 360-degree video can help get you one step closer to actually being at those places and in those moments. 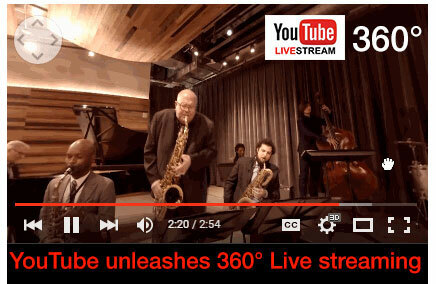 Today, we’re taking immersive video even further with 360-degree live streaming on YouTube." For one of its first big tests with 360-degree live streaming, YouTube will stream a handful of performances during Coachella from April 22 to April 24 with T-Mobile is sponsoring the stream. Google has been live streaming the music festival since 2011. YouTube says "We first launched support for 360-degree videos back in March 2015. From musicians to athletes to brands, creators have done some incredible things with this technology. Now, they’ll be able to do even more to bring fans directly into their world, with 360-degree live streaming. And after years of live streaming Coachella for fans around the world who can’t attend the festival, this year we’re bringing you the festival like never before by live streaming select artist performances in 360 degrees this weekend." What's in YouTube 360-degree live streaming for us all? The YouTube blogpost adds "What excites me most about 360-degree storytelling is that it lets us open up the world's experiences to everyone. Students can now experience news events in the classroom as they unfold. Travelers can experience faraway sites and explorers can deep-sea dive, all without the physical constraints of the real world. And today's kids dreaming of going to a basketball game or a concert can access those experiences firsthand, even if they're far away from the court. What were once limited experiences are now available to anyone, anywhere, at any time." This is really a good bit of storytelling from Google right there. We just hope that brands and marketers – and content creators are up for the challenge. And are they ready for it yet? "Starting today, we’re also launching spatial audio for on-demand YouTube videos. Just as watching a concert in 360 degrees can give you an unmatched immersive experience, spatial audio allows you to listen along as you do in real life, where depth, distance and intensity all play a role. Try out this playlist on your Android device." It seems like platform based live streaming may be the imminent future for live streamed content. And now with 360 degree formats, it may as well become our go to sources for inspired content – well, so we hope. Buzzfeed's Facebook Live content on the exploding watermelon has 10,559, 409 views already! We'll just wait and see which brands jump on this new opportunity and gain traction. Content has to be thought through to make sure it works in context with the feature. You don't live stream, say, someone applying mascara in beautiful 360 degrees. But you would probably live stream a daring video of a landing on Mars. That's marketing basics. That's Digital Marketing Strategies 101. This was so expected. In fact, I think YouTube (Google or Alphabet) were caught by surprise with Facebook's huge video centric announcements last week. While Facebook want to take on the real video giants – they're still playing second fiddle, even though their announcements came first. YouTube just about made it real. Looking forwards to the Caochella broadcasts! The more immersive the better it is for us consumers. 360-degree video is fine, but live broadcasting it is going to be so difficult unless you have a proper rig. And how many brands or agencies have that capability today – or in the near future? This is just another gimmicky attempt at staying ahead of the game. Most marketers will not know what to do with this. Agree with previous comment. You will need cameras, and live broadcast capability. This is not for every one. Good for events and big product demos. Just a note: Broadcasting and live streaming are not the same. Live streaming, which refers to content delivered live over the Internet, requires a form of source media (e.g. a video camera, an audio interface, screen capture software), an encoder to digitize the content, a media publisher, and a content delivery network to distribute and deliver the content. I also do youtube marketing and I get many help from freelancer of upwork. are you looking for youtube marketing service, here is best freelancer of youtube marketing of upwork.